Rabbit anti Human, Mouse Interleukin-23 alpha / IL23A. Western BLot: 2 - 4 μg/ml. Like interleukin-27 (IL-27), IL-23 is a recently discovered member of the IL-6/IL-12 family of proinflammatory and immunoregulatory cytokines. It exists as a heterodimer composed of the IL-12p40 subunit and a novel p19 subunit. 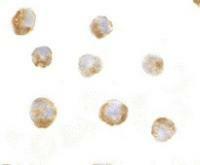 IL-23 is secreted by activated dendritic cells, macrophages, and monocytes. Its biological activities include enhancing the proliferation of memory T cells and the production of IFN-gamma, IL-12, and TNF-alpha from activated T cells, and can stimulate macrophages to produce TNF-alpha and nitric oxide. It has also been shown to possess potent anti-tumor and anti-metastatic activity in mouse models of cancer, suggesting a potential role for IL-23 in therapeutic treatment of cancer. Hunter CA. New IL-12-family members: IL-23 and IL-27, cytokines with divergent functions. Nat Rev Immunol. 2005 Jul;5(7):521-31. PubMed PMID: 15999093. Oppmann B, Lesley R, Blom B, Timans JC, Xu Y, Hunte B, et al. Novel p19 protein engages IL-12p40 to form a cytokine, IL-23, with biological activities similar as well as distinct from IL-12. Immunity. 2000 Nov;13(5):715-25. PubMed PMID: 11114383. Sheibanie AF, Tadmori I, Jing H, Vassiliou E, Ganea D. Prostaglandin E2 induces IL-23 production in bone marrow-derived dendritic cells. FASEB J. 2004 Aug;18(11):1318-20. Epub 2004 Jun 4. PubMed PMID: 15180965. Pirhonen J, Matikainen S, Julkunen I. Regulation of virus-induced IL-12 and IL-23 expression in human macrophages. J Immunol. 2002 Nov 15;169(10):5673-8. PubMed PMID: 12421946. Store the antibody at 2 - 8°C. 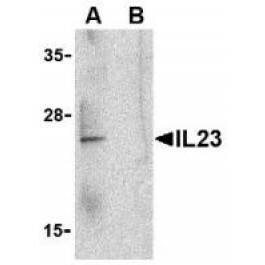 This antibody reacts to IL-23. Purity Detail: >95%, as determined by Coomassie stained SDS-PAGE.